Roger Duane Raver was born on July 5, 1930 to George and Betty (Snare) Raver in Oakland, Nebraska. 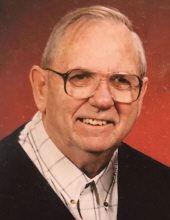 He passed away March 29, 2019 at the Tekamah Care and Rehabilitation Center in Tekamah, Nebraska. Roger lived in Craig, Nebraska nearly all his life. He attended school in Craig. He had a passion for farming, and did that for a few years, until he was drafted in 1951. He served in the U.S. Marine Corps until 1953. After the service, he continued to farm. On April 18, 1958, Roger married Eunice “Sue” Gerch. In 1963, he started working for Craig Public School as a janitor and bus driver. In 1974, they bought the local tavern in Craig known as Rog & Sue’s Retreat. Many memories were made in the bar until it closed in 2015. Roger loved sports, whether it was coaching local teams, supporting the Huskers, or cheering on the OC Knights. He especially enjoyed watching his kids’ and grandkids’ activities. Roger was also a member of the American Legion, Veterans of Foreign Wars and Craig Volunteer Fire Department. He was preceded in death by his parents; wife, Sue; four children: Bob, Ronnie, Connie and Julie; three brothers: Richard, Ronnie and Robert. Survivors include his two daughters: Jean (Bart) Meyer of Craig, Cathy (Dan) Hall of Omaha, NE; seven grandchildren: Quin (Serenity) Raver, Ashley Helzer, Julie Helzer, Austin Hall, Christian Hall, Ian Hall and Avery Hall; five great grandchildren: Payton Novak, Preston Novak, Paxton Buermann, Talia Raver Ella Raver; daughter-in-law, Jan Raver of Blair, NE; sisters-in-law: Joan Gerch of Oakland, Joyce Raver of Oakland and Karen Raver of Cheney, WA; several nieces, nephews and cousins. Military Honors will be held at the Craig Cemetery. "Email Address" would like to share the life celebration of Roger D. Raver. Click on the "link" to go to share a favorite memory or leave a condolence message for the family.